Please keep in your thoughts and prayers for the innocent victims whose lose their life and injured in the deadly explosion at a fertilizer plant on Wednesday 17th2013 in West, Texas. This week has been really been a somber one for me, on Monday people hurt and killed due to man-made activities in Boston Marathon.Wednesday again, people died and injured from the deadly explosion at a fertilizer plant in West, Texas. Lots of people got hurts and according to news, first responders like firefighters and police men and women are missing. Hope they will able to find more survivors. This morning when I took car out of garage to drop the daughter to school, there were 10 police cars in our neighborhood. There were trying to arrest a man, for the first time in my life I saw police arresting a man in handcuff and putting him in police car in real. I saw that in news and movies several times not in real. One police men even showed that you have to this way not this way. Finally I was relieved when I get out the neighborhood. After dropping her in the school, when I came back, all police cars are gone and it really quite. That is how my day was started. Only few dishes that can make my daughter eat without any fuss is rasam, cabbage thoran, Beet root thoran. First one is liquid version, she calls it as soup and other ones are stir fries. She know the soup pot as well as skillet in which I make stir-fry, she will say mama give me more soup and more beetroot. She eats her breakfast, lunch and dinner in her princess plate. Also amount of rice will less compare to the rasam (soup) and stir fries. I am happy at least she is eating something without any tantrums. Otherwise, I need this I need that, finally she say I don’t need this. Give me potato chips. Usually I make simple rasam with tomato, garlic with tamarind and rasam powder. I won’t take much pain to add cooked lentils into the rasam. My daughter like this version, and always dare to attempt any other version of rasam. Last week I had some pineapple left, normally we ate just like that otherwise it goes to make pineapple pachadi. I thought why don’t try to make pineapple rasam. I asked my hubby “can I make rasam with pineapple”. He: “Do you think it is good? I: “I don’t know I have seen in various blogs and all are saying it is tasty”. He:” Okay you can try it. If it is not tasty we can forget there was pineapple rasam existed”. 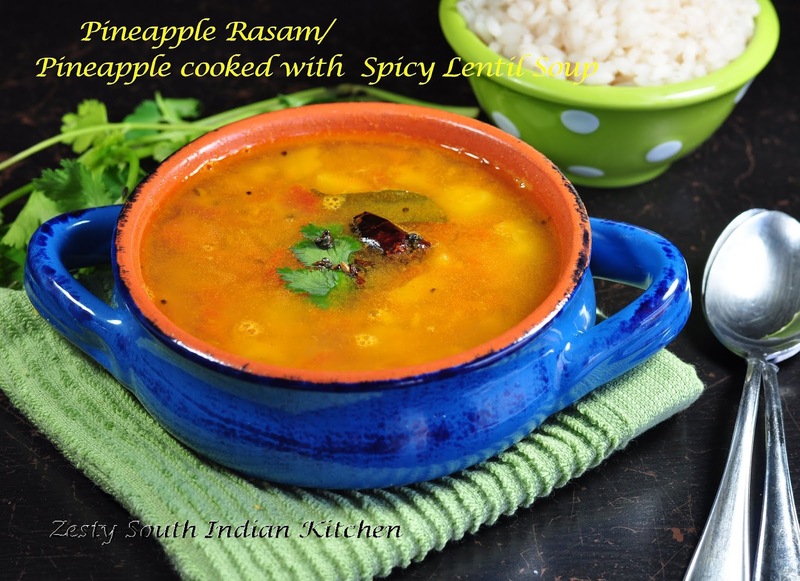 I cooked lentils to add it in the pineapple rasam. Looked at lot of recipes, and watched this YouTube video, used my homemade pepper rasam powder and also store bought rasam powder. I liked the sweetness from the pineapple as well as spiciness from rasam powders. I didn’t add any lemon juice to make it tangy. If you want you can add lemon/ lime juice once everything cooked as final step. Once you add lemon juice no further heating is advised. This recipe uses chopped pineapple as well as pureed pineapple to give more flavors. I made it twice both of time it came out good. While talking to my friend I told Suja of Kitchen corner tryit. That I made pineapple rasam, she asked me the recipe, So Suja here is the recipe I talked about. If you are a fan of pineapple or love sweet curries, and then go for this one, my hubby ate this one with rice, even dosa (south Indian crepe). I made this one less spicy; adjust the spices based on your heat level. Sure it is going to a nice addition to your recipe collection. First cook the dal with 1 1/2 cup of water in a pressure cooker for about 3-4 whistles and set aside. Heat 1 tablespoon olive oil and add mustard seeds, cumin seeds, halved red chilies, fenugreek seeds and curry leaves. Once mustard seeds starts spluttering add chopped tomato and 1 cup of pineapple and 2 cloves of garlic cook for about 7 minutes or until the tomato become mushy and pineapple is cooked well in low flame. If you want you can add 1/4 cup water. While pineapple is cooking grind the 1/2 cup of pineapple into a fine puree and set aside. Once tomato- pineapple mixture is cooked well add this puree of pineapple and turmeric powder, and cooked dal along with water. When it starts boiling add pepper rasam and rasam powder, salt and water and boil for about 2 minutes. Add chopped coriander leaves switch off the flame. If you want to have tangy flavor add some lemon/ lime juice at this time. I didn’t add it. Enjoy hot with rice and stir fries. Swathi, sending my prayers. love to try your pineapple rasam. Love your version too, yumm.. I know how it would have been after seeing more cops in our neighborhood, this happen to me also. 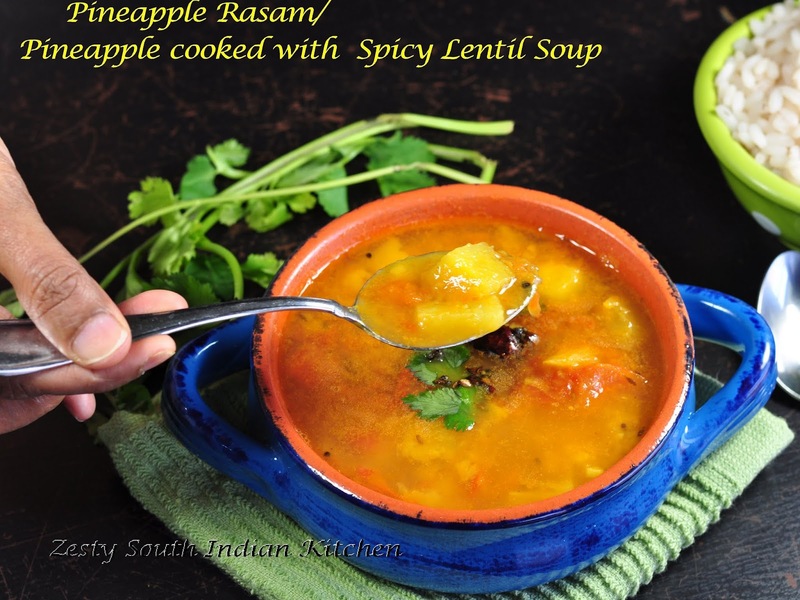 Pineapple rasam looks yum, I simply love it. Pine apple is my fav.lovely rasam.As you said ,we can have it with anything. Glad Suja you liked the recipe. Thanks my friend for trying it. 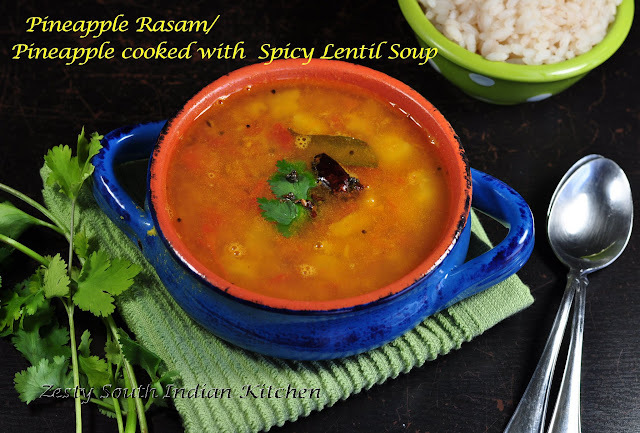 Lovely rasam, I do make this quite often. Delicious and delightful Swathi.Thanks for sharing. delicious rasam with pineapple flavor Swathi..
Es una delicia quiero probar se ve muy rico,abrazos y abrazos. never have tried rasam with pineapple. now surely will. thanks for the recipe Swathi. Wow!! 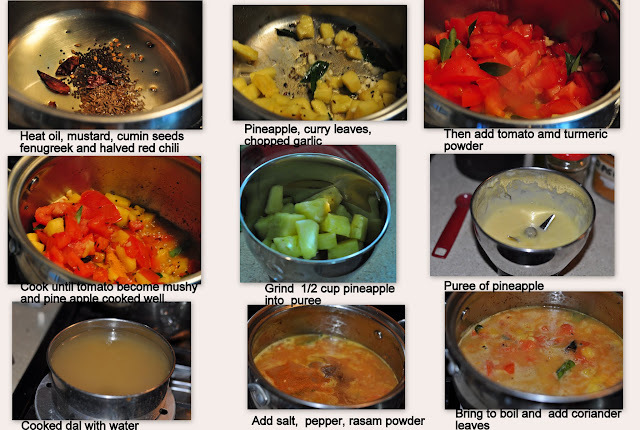 my search for a delicious pineapple Rasam ends here… Thnx for the step by step presentation..
my fav rasam whenever I get pineapple I have to make it. Pic looks very tempting. That is a delicious and fresh rasam. Never tried with pineapple, it has always been one of these, plain, tomato, lemon rasam. And I definitely would try this. The step by step preparation pics, makes it all the more easier. Thanks for stopping by my blog, I’m following you too. flavorful and delicious rasam dear,looks a must try combination..yummy!! Never tried this.. must take really yum! I’ve tried a pineapple rasam recipe before and it came out so delicious have made it a few times already. Love the taste and flavor rasam. Reading your post gave me the chills. I agree with last week being one of the harshest weeks with multiple tragedies. Keep safe and pray for all. 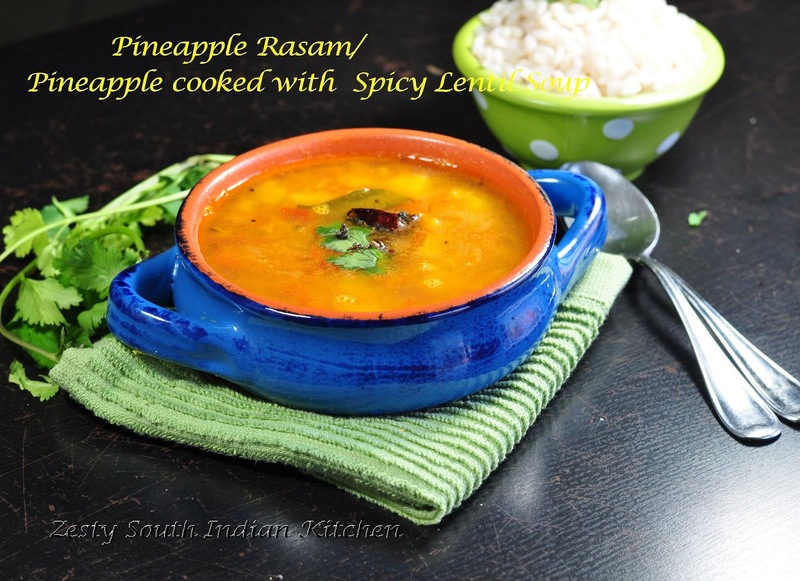 Pineapple rasam looks delicious, I make very similarly too. What an interesting combination of ingredients! I love the sweet and spicy. Such a great recipe Swathi! Very healthy and flavorful rasam, lovely clicks dear.